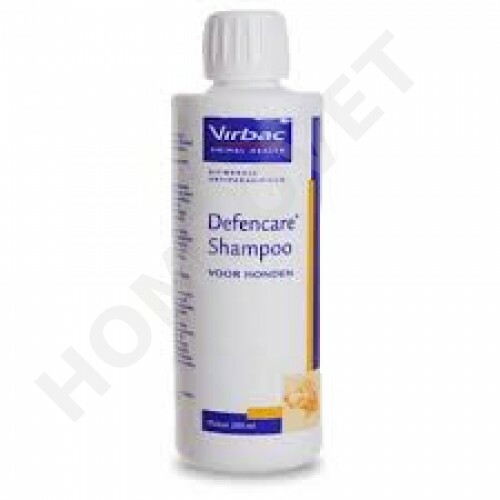 Defencare shampoo is a fast-acting anti-parasitic shampoo against fleas and ticks in dogs. The active ingredient is permethrin, which kills all the fleas quickly and reliably. It has a toxic effect on the nervous system of insects, fleas are killed within hours. Permethrin is safe for humans and dogs (Do not use on cats!) and is biodegradable. Depending on the infection pressure treated animals are protected from reinfestation1 to 2 weeks. Defencare shampoo works short and is therefore ideally suited for the control of existing flea and / or tick infestation. NEVER use permethrin on cats! Exercise caution and follow label warnings when using permethrin products if you have cats.. Avoid using it on dogs who play with or are groomed by family cats. Don't use it around fish tanks or ponds either as it is toxic to fish. During application protective gloves should be worn. When applying do not eat, drink or smoke. Clean hands thoroughly after application. In case of accidental contact (mucous membranes, eyes), rinse thoroughly with water. If you feel unwell seek medical advice. When extensively used in rooms, ventilate. Toxic to fish, reptiles and bees and cats. Keep out of water. A single wash is sufficient. The fur of the animal is moistened with handwarm water and then treated with the appropriate amount of Defencare shampoo until foaming. Leave for two minutes and then rinse off with water .